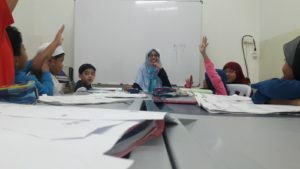 “As a teacher of Hijrah’s Little Sahaabah Adventure Club, not only do I teach children, I also get to learn as I teach. The curriculum we teach encompasses the Harmonious values that Islam teaches. It makes me revise the knowledge that I have studied and think of creative ways to simplify and help them apply it to daily life instead of just regurgitating it.. These are lessons that are not only taught to children but also a revision for all of us regardless of age. I have grown attached to both students and parents and come to realise that family is not only the ties I have at home but also the people I am surrounded with at work on a daily basis. to be a little sahaabah (companion).